Rice is a staple of meals in a variety of cultures. From curries to burritos, many of your favorite dishes probably include those little white grains. But while rice in moderation can be part of a well-balanced diet, the fact remains that this grain is high in carbohydrates and has little nutritional value. Though you can purchase cauliflower from the grocery store that has already been riced, the process is not difficult to take care of in your own kitchen. All you need to start is a few ingredients and your Oster® Designed for Life 14-Cup Food Processor with 5-Cup Mini Chopper. Wash the cauliflower head and dry thoroughly. Remove all green pieces and cut the remaining vegetable into several large chunks. Use a the Oster® Designed for Life 14-Cup Food Processor fitted with a grater blade to cut down the pieces of cauliflower to a grain-like consistency that should resemble the appearance of white rice. Pour the cauliflower rice onto a paper towel or cloth and press to remove moisture. Stovetop: In a large pan, heat 1 tablespoon of olive oil over medium-high heat. Add the grated cauliflower and salt and pepper to taste and saute until the grains are soft and lightly golden-brown in color. Remove the pan from heat and allow the cauliflower rice to cool slightly before serving. Optional: Saute with minced garlic or your favorite herbs for extra flavor. Microwave: Place cauliflower grains in a microwave-safe bowl sealed tightly with plastic wrap. Microwave the bowl for about 3 minutes to steam the cauliflower. The resulting texture will be more similar to traditional white rice than that from other cooking methods. Oven: Heat the oven to 400 degrees Fahrenheit. Toss the cauliflower in about 1 tablespoon of olive oil and salt and pepper to taste until well-covered. Spray a baking sheet lightly with oil and spread cauliflower rice evenly on the surface. Roast the grains for about 12 minutes or until the cauliflower begins to turn light golden-brown. Cauliflower rice is a perfect dish on its own, but can also be incorporated into some of your favorite recipes. 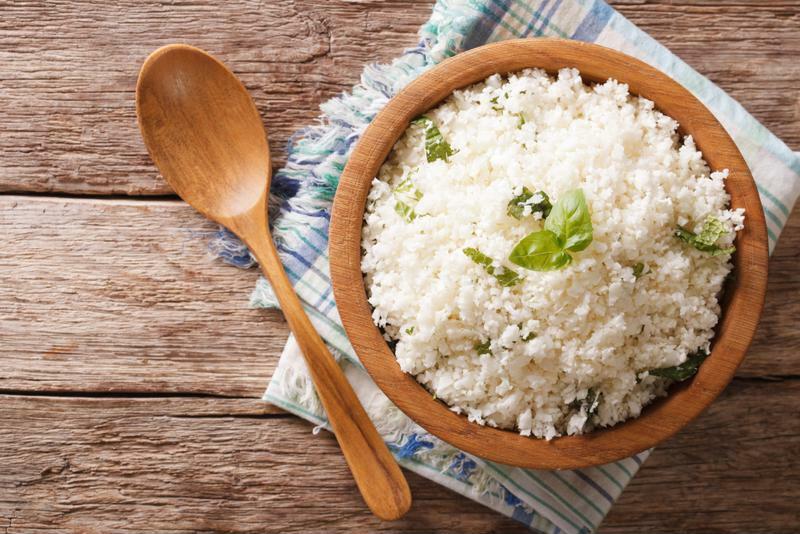 Though a batch of cauliflower rice can be enjoyed on its own as a delicious dish, preparing the rice can also be just the beginning of your culinary efforts. You can use cauliflower rice as a substitute in many of your favorite comfort foods, such as curry, casserole and even pizza. Heat oil on medium-high in a wok or heavy pan. Add the eggs to the pan and cook without stirring for about 30 seconds. Flip the egg mixture and let it cook on the other side for another 15 seconds or until cooked through. Set the eggs aside. Add the snow peas, green onions, garlic and carrots and saute over medium-high heat for about 5 minutes. Add the cauliflower rice, ginger and soy sauce and continue sauteing until the cauliflower is soft. Stir in the sesame oil and egg and serve hot. Heat oil in pan over medium heat. Saute mushrooms until soft and then put aside. Add shallots and garlic and saute until translucent. Add cauliflower rice, salt and pepper and cook until rice is golden-brown. Turn heat down to medium-low and slowly pour in vegetable broth. Cook 6 to 8 minutes or until cauliflower is tender. Add cheese, sauteed mushrooms and vegetable broth, stir to combine and cook for about 4 minutes or until desired consistency is reached. Remove from heat and serve hot.